As an agency recruiter, how can you ensure that you develop business processes that hone in on delivering exceptional candidate experience across all your vacancies and help you sustain a competitive advantage in the dynamic recruitment landscape? Being proactive, relevant and helpful in your communication keeps your agency top-of-mind for the candidate, this is where the chatbot steps in. A recruitment chatbot is a software that recreates human conversational abilities to assists recruiters in candidate engagement during the recruiting process. We’ll cover 3 ways you can leverage chatbots to help improve your candidate engagement. Having a candidate database you’ve spent many hours and money building up is like sitting on a potential goldmine that you didn’t know existed. Making the most out of your database required constant maintenance. Candidates go on and off the market, develop new skills, switch jobs and grow as individuals. It only makes sense that consistently keeping up with their journeys ensures that your database is always up-to-date and relevant. Manually re-engaging with candidates exhausts precious hours which recruiters are already spending on high-value activities. 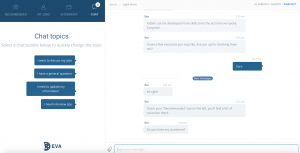 Utilizing a chatbot automates the process of re-engagement with the added bonus of managing multiple candidate conversations in parallel, across numerous channels, 24-7-365. Bonus – recruiters don’t need to cold call candidates anymore. In fact, referrals from previously placed candidates and candidates from the existing database were the two most popular sourcing strategies of 2017. For example, you have a pool of candidates that you haven’t heard from in the last 6 months. Chatbot would take over the communication and send them a non-threatening “Haven’t chatted in a while! Would you like to let us know what you’ve been up to?” message, automatically populating their profiles with updated information. The result – intelligent database full of grateful candidates. Top talent rarely stays on the market for longer than 18-21 days. Quality hires are on only on the market for 10 days! 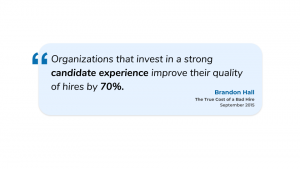 In the wake of talent scarcity, quality hires are flooded with offers from recruiters. For an agency, developing and retaining a competitive advantage becomes hard to sustain. Technology has created a paradigm where candidates expect recruiters to be available 24/7 to answer any questions they may have about a vacancy or to simply get an update on their status along the hiring process. ‘Always-on’ and ‘Available’ is the new normal. Proactively engaging and establishing meaningful personal relationships is what helps you agency to stand out. A chatbot takes your candidate engagement one step further when it starts to recommend relevant jobs to candidates via their personal login portals. Often powered by AI and machine learning, a chatbot recommends the most fitting vacancy to individual candidates, based on their previous work history, positions they have applied for and the past placements in your database. Providing relevant and well-matched jobs to candidates demonstrates that you not only care about their fit to a particular vacancy, but you are also invested in their career progression. Guess what agency candidates are more likely to respond to? The one that demonstrates they are invested in their professional growth on a consistent basis and is always available when they are ready to have a conversation. Many recruiters are worried about chatbots being void of the human feel or, simply put, a personality. 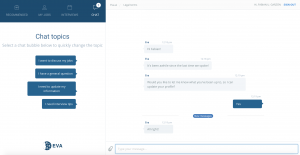 However, EVA’s Chatbot can be configured to align with your agency brand, ensuring communication consistency is carried across every candidate touch-point. Is your agency voice laid back and friendly or do you cut straight to the chase? Do you dig a bit of classic British humour or do you enjoy the latest internet memes? Whatever your communication style, a chatbot should replicate your brand voice effortlessly. It’s up to your agency to ask “What’s your salary?” vs “How much are you currently earning?”. The chatbot will establish relationships with candidates using personable words in short bursts. Taking it one step further, the chatbot learns from the context and nudges the conversation accordingly. Eva.ai team is working on adding candidate re-engagement, job recommendation, and brand customization to EvaBot in the upcoming release. Find some time to see EvaBot in action here.